Heat oven to 375°F. Spray 13x9-inch pan with cooking spray. In bottom of pan, spread nuts. 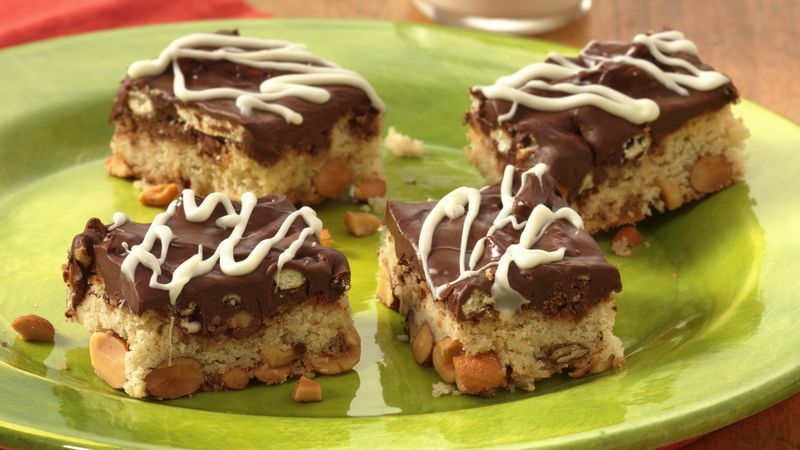 Cut cookie dough into 1/2-inch slices; place over nuts in pan. With floured fingers, press dough evenly to form crust. Sprinkle toffee bits over crust; press in lightly. In large microwavable bowl, place chocolate chips and butterscotch chips. Microwave on High 1 minute 30 seconds to 2 minutes or until melted, stirring every 30 seconds until smooth. Stir in peanut butter until well blended. Fold in pretzels. Spread mixture evenly over baked crust. In small microwavable bowl, place candy coating. Microwave on High 30 to 60 seconds or until melted, stirring every 15 seconds until smooth. Drizzle over bars. Refrigerate until chocolate is set, about 30 minutes. For bars, cut into 6 rows by 6 rows.